For #FoodTipsMonth, here's the story of how a food viz came to appear in one UK newspaper. “Like most good things, it was complete and utter fortune,” says Daniel Bird, head of online content at Leicester Mercury newspaper. Out of the blue, Daniel got an email. 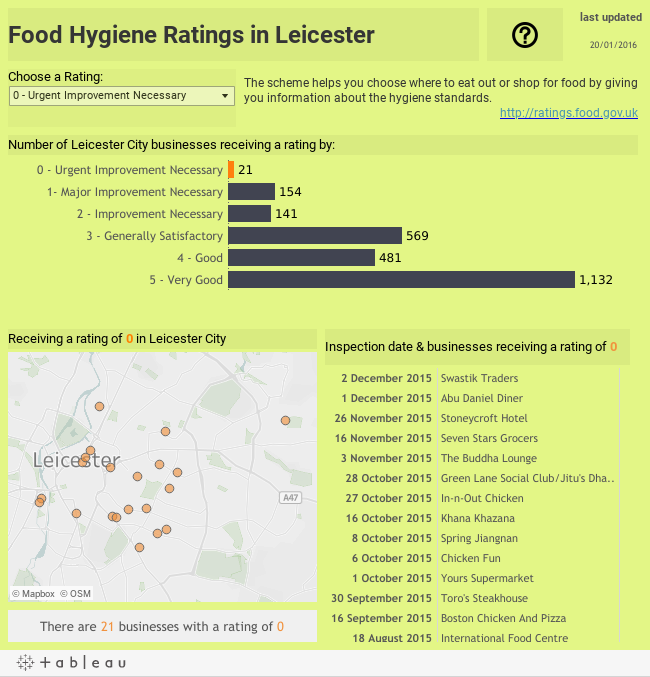 It led him to this data visualization on food-hygiene ratings for restaurants in Leicester. The paper had just published a story on the same data. The email and the viz came from Tableau Zen Master Rob Radburn. Rob, who’d read the paper’s piece, had visualized the data. And perhaps most importantly, he was willing to share. “The data was just a table of restaurants that had a zero rating, but it was obvious it would benefit from a map that showed all the data,” says Rob. Daniel was intrigued. The interactive viz meant readers could explore the data themselves. So after fact-checking the figures, he embedded the viz in the paper’s story. The result: The piece “improved tenfold,” says Daniel. “There was a significant increase on my time-on-page metric, because people stayed on the page. And they shared it as well, which is a hugely important thing to get more eyes on the content,” he says. Rob wanted to do something good, and Daniel was happy to provide the platform. The partnership proved so fruitful that the pair decided to tackle a story on local housing prices. That viz-enriched story also performed well, says Daniel. So how does the editorial process work? The two are figuring it out as they go. For the first two pieces, Rob has worked independently, submitting the final viz for Daniel to stitch into the story. But for future projects, Daniel can imagine a more integrated process, with Rob working more closely with the editorial team during the data exploration process. As for fact-checking Rob’s work, Daniel says it’s as simple (and laborious) as making sure the viz correctly reflects the figures in the data set. “It’s time-consuming, but fact-checking always is,” says Daniel. And the two are confident other news outlets can adopt a similar model. Granted, not everyone gets approached by an experienced viz whiz willing to work for free. But look around, and you just might find one, says Rob. “Perhaps find ways to reach out to the data-viz community. I think at lot of people would be interested,” says Rob. Put in the effort, and your audience will thank you, says Daniel. “It adds incredible value to online content. And I think the audience not only engages with it but also appreciates it. They see something that has clearly taken a lot of time and a lot of expertise,” he says. Whatcha got cookin' on your dashboard? Share with us on Twitter using the hashtag #FoodTipsMonth! So where do Leicester City have their pizza parties then?